J.M. 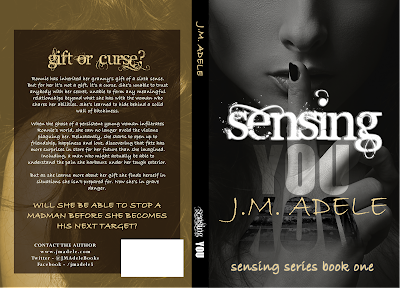 Adele's Author Page: Happy Book Birthday Sensing You! Happy Book Birthday Sensing You! Former nurse, reluctant romantic, chocolate lover and serious reading addict, J.M. Adele is the author of contemporary romance, Remembering Home, and paranormal, romantic suspense, Sensing You. She also owns and runs The Flare Up book blog, where she shares her reading obsession. On most days you can find her running between the desk, and wrangling her three boisterous boys, while carrying a book in one hand. When everyone else drifts off to dreamland she escapes into the worlds conjured by the characters in her head.